I've done this myself on many occasions, even though I know it's a common mistake I need to watch out for. Walk up to photocopier carrying sheet/book to copy. Grab copied paper and rush out of room, leaving the original in the copier. Can anyone suggest a way that the photocopier could be designed to prevent users making this mistake? A sign would seem to be the most obvious way, but the trouble is that the moment I need to read it is likely to be the moment I'm least inclined to stop and read anything. This is a similar question to the one about ATMs, and a similar approach could be adopted. 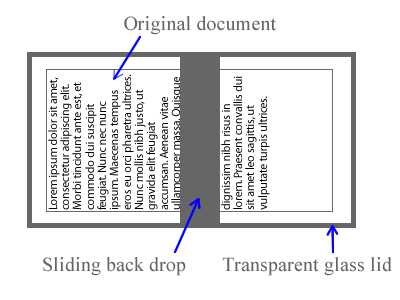 Since modern machines can detect that there is an original on the glass (or in the ADF), it would suffice to prevent access to the copies until the original is removed. For that, the completed copies would have to remain inside the machine behind a door which is only unlocked when appropriate to do so. I used an industrial-size Kodak copier in the mid-Eighties which did this. The finisher where copies ended up (whether actually collated, folded or stapled, or not) was inside the main body of the machine. Because it was a very fast machine which moved paper with compressed air and vacuums, all paper movement was internal and doors were only unlocked when it was safe to do so. The only thing which would be needed is a lit indication near the output door handle (as well as on the main display) to explain why it's locked shut. In addition to my other method, a cheaper indication would be to have the copier beep when it's finished until the original is removed from the platen. Accompany the beep with a display message and warning light indicating the cause of the "error"1. This would also allow the original to be removed after scanning, while printing is happening (there would be no need for the beep). A refinement would be needed to cope with removing the current original and replacing it with the next; that shouldn't cause the beep either unless it looks as though nothing is going to be done with it. 1 It's not an error, of course, so its code should not start with E for Error, and it should have a yellow indicator light, not a red one. Design the copier so that the original is deposited with the copy. The user will already need to pick up the copy to leave or to verify that the copy is satisfactory. Alternatively - a conveyor mechanism that gently deposits the book/or push it out the end where you would look to pick up your copies. You can add a timer on the copier cover so that this can be triggered if the cover has not been lifted within 2 seconds. That way it covers the scenario where the user needs to scan the next pages. I'd also investigate the ROI on supporting books/bulky originals, because I'm not convinced there'd be too many people who'd forget their originals in these cases. Instead of a copy machine that spits out copies from the side of the machine, redesign it to spit copies out to the same spot where your original is. That way, you will always grab everything you need in one place before you jet off! @Andrew is spot on to say that the ATM design is the right way to think about this - you get your money last, since that makes sure you don't forget to take your card. So I'd separate the scanning part of the process from the printing part. So first off you put your original on the scan bed, press a scan button to scan, remove, add the next sheet and so on until you're done. Printing would only start once you're done scanning. This might seem like it would slow you down, but you're not going to copy a 400 page doc page by page without a sheet feeder anyhow, so it's not really a big problem. A sheet feeder should pass the original next to where the copies come out so you naturally pick up both at the same time. For single page copying if you scan, but haven't opened the lid to remove your original then the copier knows that there's something still on the bed. So it can refuse to print until you remove it, with a suitable message to say why it's not printing of course. Once you've done all your scanning and removed your last copy you hit the print button and your copies come out. Having a prominent display of how many pages you've scanned or a timeout would be useful to prevent accidents (or pranks) like people scanning something, but not printing so that the next user gets more than they were expecting. Place the output in a collection bin which is accessible from the front, but only when the top cover is lifted. Lifting it will give access to the output, but also uncover the input, refocusing attention. The problem with the current design is the physical separation of input and output, which moves the focus of attention too far away from the input. Have the cover of the copier pop up and maybe chime when the copies are done, leaving the original exposed and grab-able. For minimal modification to present photocopiers, you could have a sign always placed on top of the stack of output copies. This would be the most suitable place for a sign that reads "Please remove your original." as it would be directly in the path of the only action you know the user is going to take. The sign could be attached to the machine, and be made to automatically retract once the original cover is opened. This solution could actually be retro-fitted to existing copiers with minimal modification using just a firmware change, if it were worth using a bit of extra paper and toner (this might be arguable for a public library, say, where forgetting an original could be a big inconvenience (people remembering it after they have left! )): The photocopier could simply be made to add a page matching the sign description above to the end of every copy job. Set up the copier so the glass faces down or vertical and the user has to hold the original in place. The Stack Exchange bots are asking for a longer answer with more context. So here it goes: With a vertical glass, it would be impossible for the user to walk away without their original since it would fall to the ground when they left. The easiest solution would be to ensure that the capture of the original was as close to instantaneous as possible so that the time required to hold the original against the glass was limited. Software would also be designed to auto-rotate the copies in perfect 90 degree increments. Finally, the hardware could sense where the original is located (perhaps using touch-sensitive glass) so that the scanner light would only shine where the original is placed against the glass. Obviously this isn't a solution for every use case where a copier is used, but it does solve the original question. The major factor in forgetting the copy is because users cannot see their original when the lid is closed. There is an innovative solution to this: make the lid transparent. The user can see their original in the photocopier before, during and after scanning. This makes it significantly less likely that the user will forget to take the original. The sliding back drop moves between two panes of glass, in tandem with the photocopier element. What about a photoelectric cell (or a weight, but with paper that's rather tricky) that detects if the original document is still on the scanner before releasing the copies? One of the most effective methods for "not forgetting what you didn't come for" is the ATM's "get your card so we can give you your money" method. Cheap method: Stick a paper saying "Don't forget to collect the original documents!" on the base of the collection tray. Good chance user will see that when collecting the copies. Modify displays: Most photocopiers/printers have a digital display on them for various purposes. Rather than just saying "Job done", you can tweak the message to say "Collect the documents and the copies" or something to first remind the user to collect the originals. Modify hardware: You can have a backlight or something under the closing lid go on/pulsate (for a while) when the job is completed to draw the user's attention to the lid (and hence the original document). It should be a good enough affordance to make the user take some action. You can make this smarter by doing it only if the lid is not opened following the completion of a job (a few seconds' delay). An MP3 player triggered to play "Please don't forget your original. Have a nice day!" Very interesting problem. I think the mental model is that I input in one place and take the output from another place.. so the focus is more on the place the paper is coming out from. Photocopiers can just scan once and print any number of copies, so after the first scan, the copiers should just send the original out to a tray next to where copies are. Ofcourse this cannot be done with thicker objects like a book etc.. but they are probably less likely to be forgotten also, as they change the visual of the input space, making it more visible. Why would you not want to align the name of a user and their avatar? How could you design a dishwasher to always be able to tell whether the dishes are clean or dirty?